For anyone unfamiliar with what happened at the Partouche Poker Tour Grand Finale, Ali Tekintamgak was disqualified from the final table of the major tournament when it was uncovered that he was cheating. Tekintamgak would have “fake” bloggers signal him another player’s hole-cards thanks to their unlimited access on the floor. I think the most important thing to take away from this incident is the actual source of the problem: Media access. It’s probably odd for me to say this –being part of the poker media—but I don’t see the purpose of having reporters on the tournament floor. I love poker as much as the next guy, but I really don’t need minute-by-minute updates –which are often wrong anyway thanks to the ridiculous logistics that go with covering a major tournament. I can wait and get updates every one to three hours, with a smattering of interviews scattered in between. The segment of the poker population that is actually interested in up-to-the-minute updates is so small as to be negligible. A better method would be to have the poker media observe the access from a distance and conduct exit interviews, interviews when players are on break, and interviews with tournament officials. If an important hand goes down we will hear about it either from the player eliminated or from the winner when a break rolls around –or even more likely from a Twitter feed. 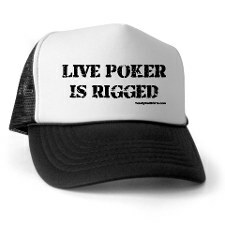 Honestly, live poker reporting is like cable news; you may think it’s an important thing, but really only 1% of your potential audience is interested in what you’re saying –and most would have no problem waiting for the end of the day recap instead. People can say that limiting the poker media to “approved outlets” would do the same job, but there is always the possibility of cheating by just about anyone in any position *(coughs) Russ Hamilton (coughs)*. After all, we are dealing with millions of dollars, so if you think a cold-deck has never been inserted, or dealers/staff have never been complicit in cheating at a major tournament you have your head in the sand. I say just remove the problem instead of trying to appease it. My thinking is to simply cut the head off the problem, and bar all media from the tournament floor. Perhaps we could set up a staging area where ‘legitimate’ members of the poker press can conduct interviews with players as they leave the floor and such. This entry was posted on Wednesday, November 17th, 2010 at 7:19 am and is filed under Poker News. You can follow any responses to this entry through the RSS 2.0 feed. You can leave a response, or trackback from your own site. Ban the guy for life from any and all sanctioned poker tournaments.